Also Called: Flame-leaf sumac, winged sumac. Trunks: Shrubs or trees; stems or trunk erect; bark grayish brown, smooth or fissures shallow; wood yellowish brown, soft. Twigs: Brown, hairy with curled hairs or glabrate, brittle; leaf scars U-shaped; buds ovoid, apex acute, scales pubescent. 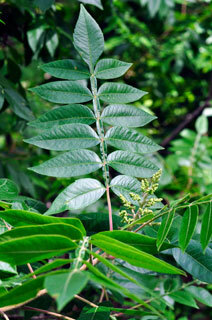 Leaves: Deciduous, alternate, odd-pinnately compound; stipules absent; petiole 1.2 to 3.2 inches, minutely pubescent; blade 6 to 10 inches; rachis winged; leaflets 9-15, sessile or terminal one with blade abruptly tapered and appearing petiolulate, elliptic to ovate, 2 to 3.2 inches long, 1 to 1.6 inches wide, base acute to obtuse, margins entire, rarely obscurely toothed, apex acute to acuminate, abaxial surface light green, pubescent, adaxial surface dark green, glabrous or sparsely pilose. Flowers: Panicles, terminal on new growth, 4 to 8 inches long, 4.8 to 7 inches wide; 100-300-flowered; peduncles .4 to .8 inch, densely pilose; pedicels .2 to .4 inch, densely pilose. Flowers mostly unisexual, some bisexual also present, radially symmetric; sepals 5, connate proximally, greenish white, ovate, .04 to .06 inch; petals 5, distinct, greenish yellow, ovate to elliptic, .1 to .12 inch; staminate: stamens 5; pistillate; pistil 1, styles 3; stigmas 3, head-shaped. Fruit: August and September; drupes, crimson to red, globose, .15 to .18 inch, viscid-pubescent; stone 1, olive-brown, ovate to kidney-shaped, smooth to somewhat rough. Uses: Native Americans used the fruits to make red and black dyes and used the bark and fruits medicinally. Comments: Rhus copallinum is sometimes planted as an ornamental for its lustrous leaves and brilliant red or reddish-orange fall foliage. It forms forming sparse thickets by underground suckers.